Here are sixteen short stories from China's groundbreaking SFF writers, edited and translated by award-winning author Ken Liu. In Hugo award-winner Liu Cixin's 'Moonlight', a man is contacted by three future versions of himself, each trying to save their world from destruction. Hao Jingfang's 'The New Year Train' sees 1,500 passengers go missing on a train that vanishes into space. In the title story by Tang Fei, a young girl is shown how the stars can reveal the future. In addition, three essays explore the history and rise of Chinese SFF publishing, contemporary Chinese fandom, and how the growing interest in Chinese SFF has impacted writers who had long laboured in obscurity. 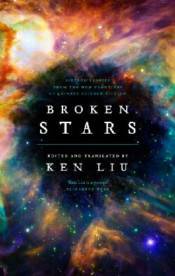 By turns dazzling, melancholy and thought-provoking, Broken Stars celebrates the vibrancy and diversity of SFF voices emerging from China.